This gorgeous 120 inch black polyester round tablecloth is washable and durable and maybe the answer to your decorating plans. It is perfect when organizing a get-together such as a wedding reception or an anniversary party. It is seamless with hemmed edges so it looks gorgeous. Once it has been used just drop in the washer and it is ready to be used again. It is made of polyester so it can be used many times and still keep it's appearance. 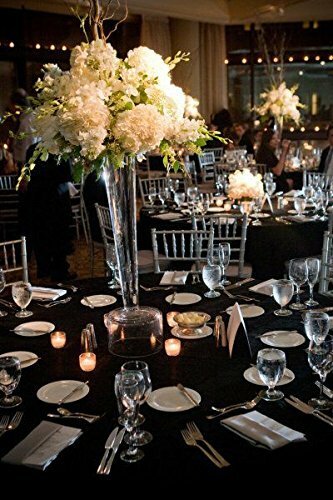 Make sure your next gala has that regal look with cloth and not plastic table coverings. Get this table linen at a super low price. This tablecloth is sure to make your next event one that all your guests will remember. Commercial Grade, Heavy Duty Tablecloth. This is Not Made From Economy Weight Fabric. Dimensions Are 120 Inches in Diameter. Gorgeous Decoration For Your Table. Great For Weddings, Banquets, Anniversary Parties, Receptions. If you have any questions about this product by Spring Rose, contact us by completing and submitting the form below. If you are looking for a specif part number, please include it with your message.